According to cytokine overtraining theory, skeletal muscle injuries are related to systemic inflammatory reaction. In response to inflammation, cells rapidly produce a series of proteins known as heat shock proteins (HSPs).These are considered to be molecular chaperones which play a universal role in maintaining cellular homeostasis. Among the subset of stress-responsive proteins, HSP27 and HSP70 are considered to be a new approach to monitoring exercise training and adaptive mechanisms. The study was designed to demonstrate the effect of sport training on changes in pro-inflammatory cytokines and HSPs, and their relation with muscle damage and body composition. Six elite canoeists (19.8 ±2.9 yr) were observed during preparatory training period (March) at the 1st, the 4th and after 7 days of the conditioning camp, and then after 3 days of recovery. The canoeing training did not induce muscle damage, decreased in IL-1β and HSP27, increased in TNFα and HSP70 concentrations. The highest changes in TNFα and HSP70 were observed 3 days after conditioning camp (during recovery) compared to initial level (the 1st day of conditioning camp). TNFα correlated with HSP27 (r = –0.563; P &lt; 0.01) and HSP70 (r = 0.651; P &lt; 0.001). Any significant changes in body composition were not observed. In conclusion, we could say that typical canoeing training improves cytokines and HSPs release, however, the changes are not related to muscle damage. 1. Banfi G., Malavazos A., Iorio E., Dolci A., Doneda L., Verna R., Corsi M.M. Plasma oxidative stress biomarkers, nitric oxide and heat shock protein 70 in trained elite soccer players. Eur J Appl Physiol. 2006; 96: 483–486. 2. Borges G.F., Rama L., Pedreiro S., Alves F., Santos A., Massart A., Paiva A., Teixeira A.M. Differences in plasma cytokine levels between elite kayakers and nonathletes. Biomed Res Int. 2013: 370354; DOI 10.1155/2013/370354. 3. Brancaccio P., Lippi G., Maffulli N. Biochemical markers of muscular damage. Clin Chem Lab Med. 2010; 48: 757–767. 4. Febbraio M.A., Ott P., Nielsen H.B., Steensberg A., Keller C., Krustrup P., Secher N.H., Pedersen B.K. Exercise induces hepatosplanchnic release of heat shock protein 72 in humans. J Physiol. 2002; 544: 957–962. 5. Fehrenbach E., Niess A.M., Schlotz E., Passek F., Dickhuth H.H., Northoff H. Transcriptional and translational regeneration of heat shock proteins in leukocytes of endurance runners. J Appl Physiol. 2000; 89: 704–710. 6. Fernández-Celemin L., Pasko N., Blomart V., Thissen J.P. Inhibition of muscle insulin-like growth factor I expression by tumor necrosis factor-alpha. Am J Physiol Endocrinol Metab. 2002; 283: 1279–1290. 7. Fielding R.A., Manfredi T.J., Ding W., Fiatarone M.A., Evans W.J., Cannon J.G. Acute phase response in exercise. III. Neutrophil and IL-1 beta accumulation in skeletal muscle. Am J Physiol. 1993; 265: R166–R172. 8. Flann K.L., LaStayo P.C., McClain D.A., Lindstedt S.L. Muscle damage and muscle remodelling: no pain, no gain? J Exp Biol. 2011; 214: 674–679. 10. Heck T.G., Scomazzon S.P., Ludwig M.S., de Bittencourt P.I.Jr. Role of heat shock proteins in skeletal muscle. Intech Open Science 2012; http://cdn.intechopen.com/pdfs-wm/38432.pdf. 11. Koh T.J. Do small heat shock proteins protect skeletal muscle from injury? Exerc Sport Sci Rev. 2002; 30: 117–121. 12. Liu Y., Lormes W., Baur C., Optiz-Gress A., Altenburg D., Lehmann M., Steinacker J.M. Human skeletal muscle HSP70 response to physical training depends on exercise intensity. Int J Sports Med. 2000; 21: 351–355. 14. Main L.C., Dawson B., Grove J.R., Landers G.J., Goodman C. Impact of training on changes in perceived stress and cytokine production. Res Sports Med. 2009; 17: 121–132. 15. 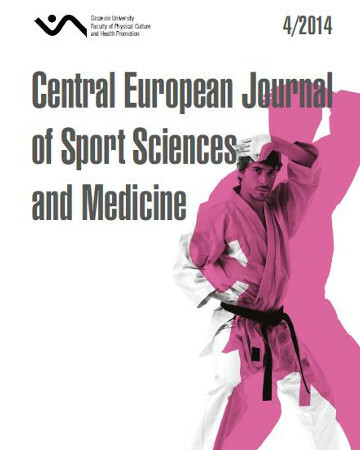 Marin D.P, Santos Rde C., Bolin A.P., Guerra B.A., Hatanaka E., Otton R. Cytokines and oxidative stress status following a handball game in elite male players. Oxid Med Cell Longev. 2011; 804873; DOI 10.1155/2011/804873. 16. Madamanchi N.R., Li S., Patterson C., Runge M.S. Reactive oxygen species regulate heat-shock protein 70 via the JAK/STAT pathway. Arterioscler Thromb Vasc Biol. 2001; 21: 321–326. 17. Noble E.G., Milne K.J., Melling C.W.J. Heat shock proteins and exercise: a primer. Appl Physiol Nutr Metab. 2008; 33: 1050–1065. 19. Paulsen G., Lauritzen F., Bayer M.L., Ugelstad I., Owe S.G., Hallén J., Bergersen L.H., Raastad T. Subcellular movement and expression of HSP27, B-crystallin, and HSP70 after two bouts of eccentric exercise in humans. J Appl Physiol. 2009; 107: 570–582. 20. Pedersen B.K. Muscles and their myokines. J Exp Biol. 2011; 214: 337–346. 22. Roubenoff R. Physical activity, inflammation and muscle loss. Nutr Rev. 2007; 65: S208–S212. 23. Sandri M. Signaling in muscle atrophy and hypertrophy. Physiology. 2008; 23: 160–170. 24. Schoenfeld B.J. Does exercise-induced muscle damage play a role in skeletal muscle hypertrophy? J Strength Cond Res. 2012; 26: 1441–1453. 25. Schutz Y., Kyle U.G., Pichard C. Fat-free mass index and fat mass index percentiles in Caucasians aged 18–98 y. Int J Obes. 2002; 26: 953–960. 26. Shortreed K., Johnston A., Hawke T.J. Satellite cells and muscle repair. In: Skeletal Muscle Damage and Repair. Ed. P.M. Tiidu). Human Kinetics. Champaign, IL, USA 2008: 77–88. 27. Steinacker J.M., Lormes W., Reissnecker S., Liu Y. New aspects of hormone and cytokine response to training. Eur J Appl Physiol. 2004; 4: 382–391. 28. Tayek J.A. Effects of tumour necrosis factor alpha on skeletal muscle amino acid metabolism studied in-vivo. J Am Coll of Nutr. 1996; 15: 164–168. 29. Thompson H.S., Clarkson P.M., Scordilis S.P. The repeated bout effect and heat shock proteins: intramuscular HSP27 and HSP70 expression following two bouts of eccentric exercise in humans. Acta Physiol Scand. 2002; 174: 47–56. 30. Tracey K.J., Wei H., Manogue K.R., Fong Y., Hesse D.G., Nguyen H.T., Kuo G.C., Beutler B., Cotran R.S., Cerami A. Cachectin/tumor necrosis factor induces cachexia, anemia, and inflammation. J Expe Med. 1988; 167: 1211–1227. 31. Weissman C. The metabolic response to stress: an overview and update. Anesthesiology. 1990; 73: 308–327. 32. Zembron-Lacny A., Slowinska-Lisowska M., Ziemba A. Integration of the thiol redox status with cytokine response to physical training in professional basketball players. Physiol Res. 2010; 59: 239–245. 33. Zembron-Lacny A., Ziemann E., Kasperska A., Zurek P., Rynkiewicz M., Rynkiewicz T., Laskowski R., Hübner-Woźniak E. Association between cytokine activity and body composition in highly trained athletes. Medicina dello Sport. 2013; 66: 199–209. 34. Ziemann E., Zembron-Lacny A., Kasperska A., Antosiewicz J., Grzywacz T., Garsztka T., Laskowski R. Exercise training-induced changes in inflammatory mediators and heat shock proteins in young tennis players. J Sports Sci Med. 2013; 12: 282–289.